Even walkways with the best traction can become slippery in the colder months and, as a facilities manager, you need to be confident that you’ve taken all measures at your disposal to avoid slips and falls. Step one should be actioned now (if not already) – ensure that you have a sufficient stock of rock salt ready for gritting paved surfaces during freezing periods. Frost and ice often turns up unannounced, and if the UK can learn anything from last year’s record lows, it’s that there isn’t an infinite amount to go around. There’s another major slip-hazard which is a threat now and will continue to be so throughout the coming months. Beginning when trees start losing their leaves, outdoor paved areas can get a build-up of leaf mould and algae. 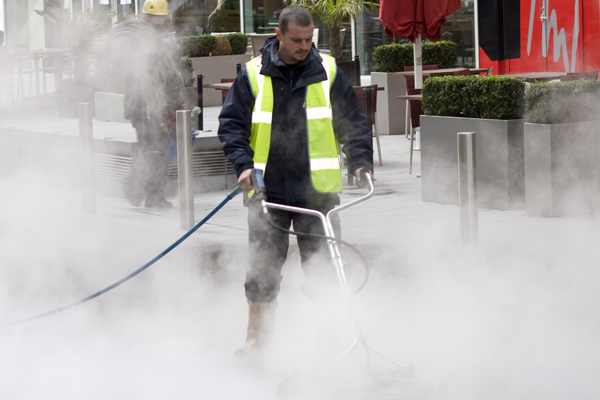 Ensuring your grounds maintenance program is up to date should prevent any risk. Many walkways also benefit from a hot pressure wash at this time of year to remove the remaining leaf mould and algae. It’s worth carrying out an inspection at the same time to ensure that all loose paving is repointed or repaved to ensure a hazard free area. Our team will use the powerful DynaJet 500 to carry out this job, and while we’re there we can also spruce up any stoneworks to leave your building looking good as new – just like we did for this client.